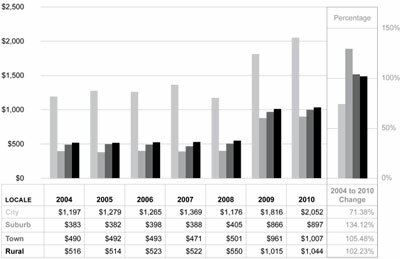 All four school district locale groups received significantly more money from the federal government in 2010 than they did in 2004 (see Graphic 6). On average, suburban, town and rural districts saw their per-pupil federal revenue double. In city districts, federal funds grew by 71 percent on average. Among the 12 subgroups, per-pupil federal revenue increases ranged from 58 percent (the small city subgroup) to 192 percent (the fringe town subgroup). [*] These considerable increases were largely due to the American Reinvestment and Recovery Act, which distributed an unprecedented amount of federal money to school districts around the country starting in 2009. From 2004 to 2008, per-pupil federal revenue grew modestly, though it increased more quickly in suburban and rural locale groups than in the town locale group, while the city locale group actually saw a slight decline. Through this period, though, the city locale group still averaged about twice as much federal revenue per pupil as any other. Since many federal revenues are apportioned based on the enrollment of low-income students, it is not surprising that city and rural locale groups were the largest and second-largest recipients, respectively, of federal funding per pupil. [*] See Appendix B, Graphic 32. [†] See Appendix B, Graphic 30 and Graphic 32. 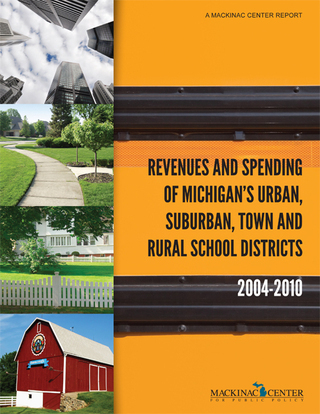 Detroit does not appear to be the only Michigan school district where per-pupil federal revenue exceeded per-pupil local revenue; Flint, Marion, Pickford and Beecher school districts may also have received more federal funds than local funds per pupil in 2010. See “2009-10 Bulletin 1014,” (Michigan Department of Education, 2011), http://www.michigan.gov/documents/mde/b101410_349994_7.pdf (accessed May 23, 2011). Lorie A. Shane, “Jobs-and-Reform Mostly Jobs-and-Jobs,”(Michigan Education Report, 2010), http://www.educationreport.org/pubs/mer/ article.aspx?id=11944 (accessed March 31, 2011).